I wanted to shoot something Christmasy, so decided to look through my old box of ornaments. I found these, a pair of mittens I embroidered years ago when my oldest son was two. One of the mittens has our old family name and the year I made them on the back. Since the divorce four years ago, I haven’t known what to do with them. I put too much time and love into these to discard, but I can’t hang them on the tree either. Maybe my sons will want them when they’re married. The books on surviving a divorce don’t tell you what to do with personal keepsakes like this. Such a small thing, like a paper cut. But we all know about paper cuts: the pain is disporportionately sharp and long-lasting. I’m happily remarried now, and I’m content to watch my stepdaughters put up their family ornaments. Maybe next year I won’t get a paper cut when I look through the box of Christmases past. 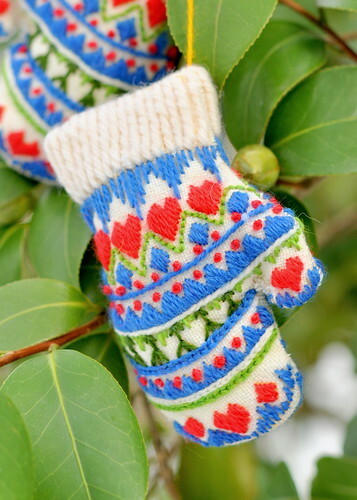 This entry was posted in photography and tagged camellia shrub, Christmas ornament, divorce, embroidered mittens, hearts. Bookmark the permalink. Those are cute! And you embroidered them? Nice! Yes, I actually made them! I was a stay-at-home mom and my oldest son was two, so I had time for this. Now I can’t imagine having the patience or time for it! I had an assortment of ornaments that I didn’t feel comfortable using on my ‘new’ family’s tree, but at the same time, I knew I couldn’t discard them either. Finally, middle son Ryan had his first home & he and I went through that special box when he visited for Thanksgiving. Some he remembered, some he didn’t – some he could recall with exact detail and those made his fact light up and his eyes twinkle. He left with his ‘own’ box – and that made those ornaments special once more – and now, 7 years later, he incorporates them in his tree, and takes time to tell Kiley & Carter why each of those little seemingly insignificant decorations are, in truth, significant reminders of precious memories. And each year, those stories are shared with yet another generation – and the memories live on. Oh Susan, thank you for sharing that. I’ve almost been afraid to show the ornaments to my sons for fear of upsetting them, but maybe they will bring back happy memories. I think it will be different after more years have passed, and they have their own families, like your sons. I’m sorry to hear that, Caroline. The end of a relationship is awful, whether you were married or not. If these ornaments hadn’t been so much work, it would be easier to part with them. You embroidered those mittens yourself? I’m very impressed! They’re adorable. I’m sorry the divorce has made you question what to do with your son’s mittens. That’s hard. This is my brother’s first Christmas without his now ex-wife, and he’s kind of struggling, too. He has a new sweetheart, but some of the old traditions are hard for him. He’s coping by creating new traditions for himself. I guess you do whatever it takes when a heart is broken, right? Blessings to the new family you’ve created for yourself. Happy holidays! Thanks, Maura. I’d forgotten about your brother. I think the only “holdover” from the divorce is figuring out holidays. They were pretty awful after the divorce and I wanted them to be over as soon as possible. The first Christmas was just my oldest son and me, trying to pretend everything was just dandy and keeping our spirits up. We finally went out for Chinese food and chucked all the old traditions. Made it easier. Now I just accept that things are going to be different around the holidays and I try to focus on what’s important. I really am blessed.